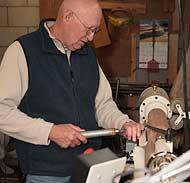 Dave Johnson has been a woodworker for 35 years and has focused his efforts on woodturning since 1999. A mathematics major in college, who spent his career as an educator, Dave found that woodturning combined his training in mathematics with his love of wood. He specializes in segmented woodturnings where the object is constructed from many individual pieces of wood (segments) which are glued or laminated together before being turned. Many interesting patterns can be generated through this process of lamination and shaping on the lathe. The patterns and colors that you see in Dave's sgemented turnings are not the result of stains or paints, but are the natural colors and textures of the different types of wood used, highlighted by Dave's flawless clear finishes. By creating segmented designs in exotic woods, Dave is able to blend the finest natural woods with the purest of geometric principles - the golden ratio, a proportional relationship developed in ancient Greece by Pythagoras to define a pattern for shapes that people find most pleasing. He uses the golden ratio as the base to personally create each design for his bowls, platters and spheres. 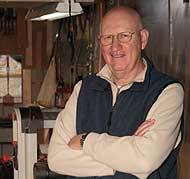 Dave's woodshop is located in Kawkawlin, Michigan. He is a member of the American Association of Woodturners and is active in the Detroit, Saginaw Valley and Midland woodturning groups. He has studied under Alan Lasen, Donald Derry and Lyle Jamieson. He has been a presenter at the Ohio Valley Woodturners Guild and has also taken students into his own shop to teach the craft of woodturning. His work has been featured in juried shows, galleries and art centers. He also works with patrons to create one-of-a-kind commissioned pieces.